Americana decorations and gift ideas. Cast Resin from Great American Collectibles Company. 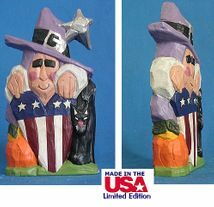 This Collectible Americana Witch and quilted heart Statue is a unique decoration for your home. Price includes free gift box.